Creative Non-Fiction: Tiger's Majesty by Val Harrison | LADY. I've paid a lot of attention to energy lately. What type of energy do I bring into the world? What type of energy do others project? And I'm realizing more and more just how powerful energy is. One person can shift the energy in a room to tense, awkward, or a feeling of being uplifted. It amazes me that so many people don't realize the energy they project in their own lives. We are human and we possess a plethora of emotions. We're not always happy individuals. And we've all been in those situations where one person negatively changed the energy in the room; we may have even been that person. And, in my quest to be more cognizant of the energy I bring into a place, I had an amazing experience that simply won't be forgotten. My boyfriend and I went to see the tigers at Myrtle Beach. My nephew suggested the idea a few days prior, but he lost interest in seeing the tigers; however, tigers are one of my favorite animals, so the idea stayed with me. Because this exhibit was free, we basically got to look at the tigers and not much else. This exhibit held three very large tigers. I've seen tigers in the past, but these seemed larger. I looked from afar, thinking "One pounce and that's it for me!" I stood back as the kids and adults marveled over the animals in excitement. The tigers were sitting in three different spots within the exhibit. One guy who seemed kind of sneaky walked by and one of the tigers tensed up and perked his ears out, alert. I joked quietly that I didn't want that guy standing behind me. As the crowd thinned out, my boyfriend and I ventured closer. We stood at the corner of the exhibit. Close by was a barred area where the three tigers ventured and played together. This space was kind of open, unlike the glass structure they were behind earlier. Since we were already near the open, yet secure, space, we quietly peeked at them and then retreated back to the safety of our corner. During this time there were others around the exhibit, but we had our own isolated viewing place. For some reason, all three tigers had gathered in the corner near me and my boyfriend. I thought this was odd, but I couldn't verbalize that to my boyfriend. The tigers had captured all my attention. Out of the three, one brought his face closer and looked directly at us. He seemed calm and content. Perhaps that's how I wanted to perceive it! Only the glass separated us from the mighty animal, and I was petrified. I wanted to speak but couldn't. My boyfriend, too, was dumbstruck. 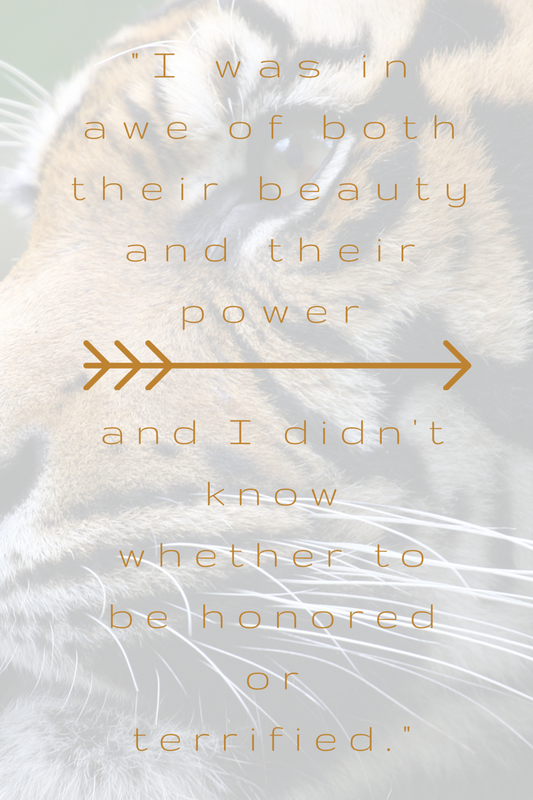 I was in awe of both their beauty and their power and I didn't know whether to be honored or scared. I wanted to run away, but the two of us could sense the tigers wanted to be near us. This experience probably lasted just a few minutes but it seemed much longer. When we broke eye contact with the tigers, they wandered away and left us standing in silent awe. This experience was a spiritual one of sorts. There was a feeling of unspoken understanding and being connected. Despite the fear I felt, there was a mutual exchange of positive energy. The experience was humbling. And, for me, it reaffirmed that all of us are a part of God's design, all energy and earth and spirit rolled into one.